Lets search for the term “tsunami” on Twitter. (One could enter a complex query, e.g., and/or, not, etc., and also search using twitter handles, word or hashtag clouds, top URLs, videos, pictures, etc). 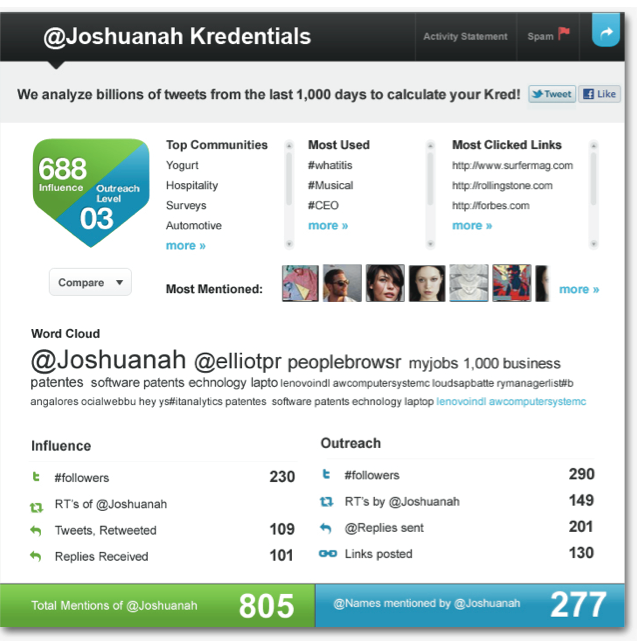 PeopleBrowsr summarizes the result by Location and Community. 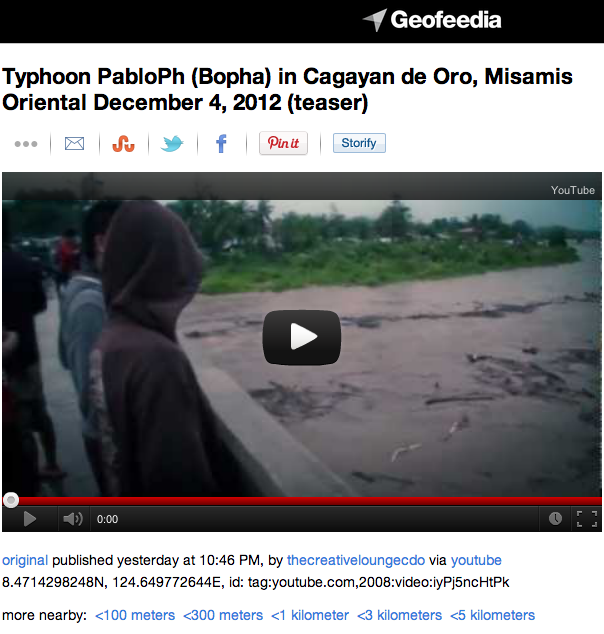 Location simply refers to where those generating content referring to a tsunami are located. Of course, many Twitter users may tweet about an event without actually being eye-witness accounts (think of Diaspora groups, for example). While PeopleBrowsr doesn’t geo-tag the location of reports events, you can very easily and quickly identify which twitter users are tweeting the most about a given event and where they are located. As for Community, PeopleBrowsr has indexed millions of social media users and clustered them into different communities based on their profile/bio information. Given our interest in humanitarian response, we could create our own community of social media users from the humanitarian sector and limit our search to those users only. Communities can also be created based on hashtags. The result of the “tsunami” search is displayed below. 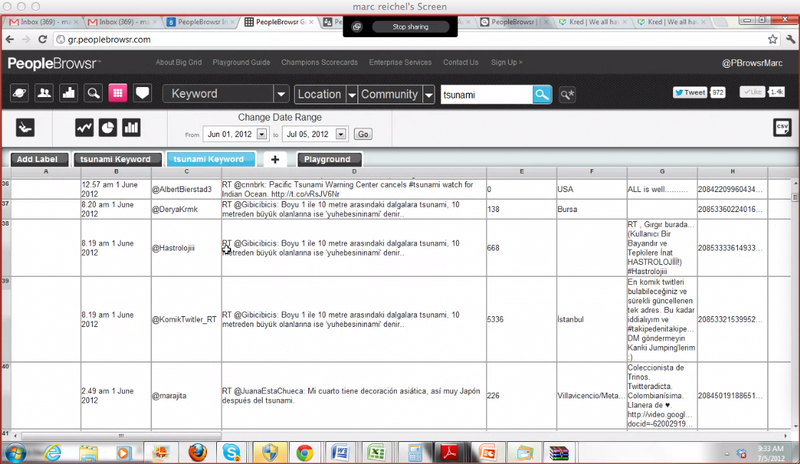 Using Kred, PeopleBrows can do influence analysis using Twitter across all languages. They’ve also added Facebook to Kred, but only as an opt in option. 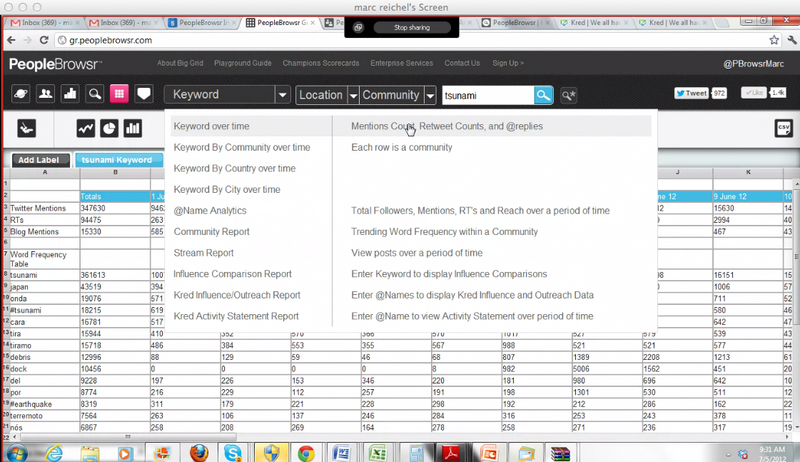 PeopleBrowsr also has some great built-in and interactive data analytics tools. In addition, one can download a situation report in PDF and print that off if there’s a need to go offline. What appeals to me the most is perhaps the full “drill-down” functionality of PeopleBrowsr’s data analytics tools. For example, I can drill down to the number of tweets per month that reference the word “tsunami” and drill down further per week and per day. Moreover, I can sort through the individual tweets themselves based on specific filters and even access the underlying tweets complete with twitter handles, time-stamps, Kred scores, etc. 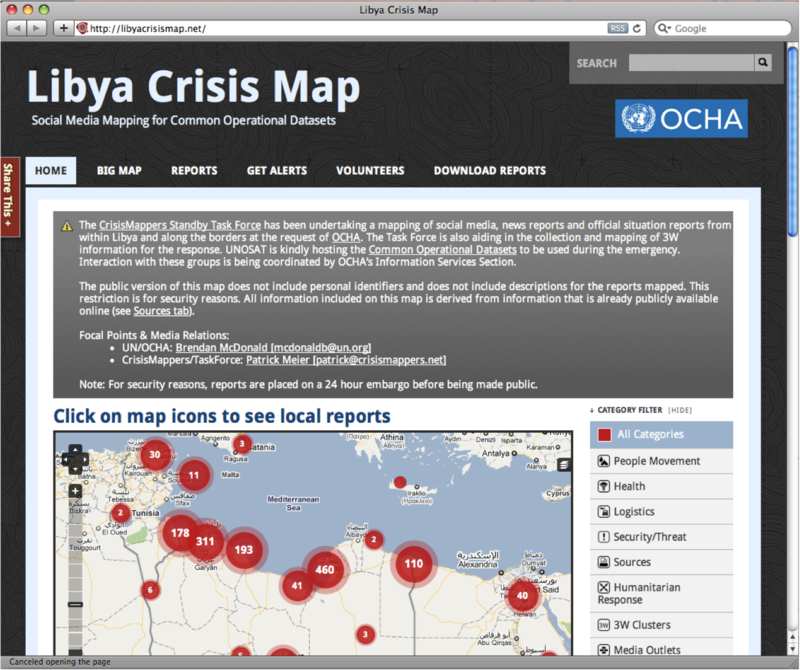 This latter feature would make it possible for the SBTF to copy & paste and map individual tweets on a live crisis map. In fact, the underlying data can be downloaded into a CSV file and added to a Google Spreadsheet for Mapsters to curate. Hopefully the Ushahidi team will also provide an option to upload CSVs to SwiftRiver so users can curate/filter pre-existing datasets as well as content generated live. What if you don’t have time to get on PeopleBrowsr and filter, download, etc? As part of their customer support, PeopleBrowsr will simply provide the data to you directly. So what’s next? Marc and I are taking the following steps: Schedule online demo of PeopleBrowsr of the SBTF Core Team (they are for now the only members of the Digital Humanitarian Network with a dedicated and experienced Media Monitoring Team); SBTF pilots PeopleBrowsr for preparedness purposes; SBTF deploys PeopleBrowsr during 2-3 official activations of the Digital Humanitarian Network; SBTF analyzes the added value of PeopleBrowsr for humanitarian response and provides expert feedback to PeopleBrowsr on how to improve the tool for humanitarian response.